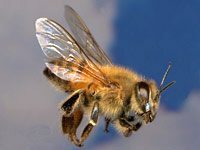 Africanized honey bees (AHB), known as "killer bees" or Africanized bees, are hybrids of the African honey bee, with various European honey bees. These bees are relatively aggressive compared to the European subspecies. 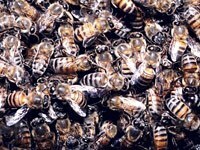 Small swarms of AHBs are capable of taking over European honey bee hives by invading the hive and establishing their own queen after killing the European queen. What are the differences between the Africanized bee and the European bee? 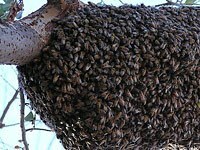 The Africanized bee tends to swarm more frequently and go farther than other types of honeybees. The Africanized bee is more likely to migrate as part of a seasonal response to lowered food supply. 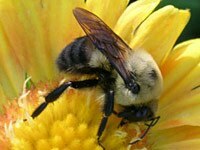 The Africanized bee is more likely to "abscond"—the entire colony leaves the hive and relocates—in response to stress. 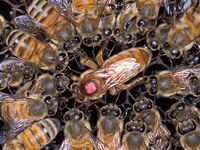 The Africanized bee has greater defensiveness when in a resting swarm. The Africanized bee lives more often in ground cavities than the European types. The Africanized bee guards the hive aggressively, with a larger alarm zone around the hive. 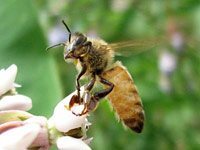 The Africanized bee has a higher proportion of "guard" bees within the hive. The Africanized bee deploys in greater numbers for defence and pursues perceived threats over much longer distances from the hive. 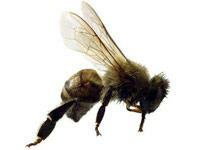 The Africanized bee cannot survive extended periods of forage deprivation, preventing introduction into areas with harsh winters or extremely dry late summers. Download free Africanized bee wallpapers, click on the image to open the large version. Print free Africanized bee coloring pages, click on the image to open the large version.